Tell Me What You’re Making For Thanksgiving! So I realize that by now, most of you might have your menu figured out. But if you haven’t, and if you’re a crazy millennial who changes their mind 23 times before settling on an idea only to wake up the morning of your party and add one more thing in… then I’m your girl. Just like last year, will you tell me below exactly what you’re making?! I want the full menu, from the snacks to the drinks to the non-pumpkin pie. Also, let’s talk Thanksgiving snacks. What do you serve to ensure that your guests can have a snack without getting TOO full? Or do you not even worry about that because, um, hello – it’s Thanksgiving and you’re all unbuttoning the top button of your jeans after dinner anyway. Are you a traditional Turkey dinner family or do you switch it up a bit? Let’s talk ideas! Starting with the most important… the cocktails. I’ve made almost all of these already this season since I couldn’t enjoy them last season – and let’s say that I didn’t forget how much I love them. They are SO good. First up, for a mocktail, this cranberry cider punch is fancy looking delicious. And if you love it, add rum. For wine based drinks, this apple cider sangria is always as a hit, as is this vanilla pomegranate sangria. For autumn margaritas, choose between (or do a margarita bar!) the apple cider margaritas, fresh cranberry ginger margaritas and pomegranate margaritas. If you want to serve something warm, maybe after dinner or even the Friday after Thanksgiving, this hot cider nog is an awesome twist on classic egg nog. And there is ALWAYS room for a nutella latte. Of course. For snacky things, my number one go-to is a massive cheese plate. I love this idea for holidays because it can be as large or small as you want. If you’re going to eat dinner at 6 or 7 like my mom serves (yes, really), I’d make a big one early on. If your guests come just an hour or so before dinner, make a teeny version of it. Easy! This pomegranate jeweled cheeseball is pretty but also stuffed with crispy sage and cheddar, so obviously. Or these adorable goat cheese truffles! If you’re feeling dippy, I suggest a roasted butternut squash hummus or this warm honey and fig blue cheese dip. What is your stance on salad for Thanksgiving? A must have or a waste of space? I like having a little greenery to balance out the table full of carbs and if you want a little switch of flavors, this crunchy kale salad is wonderful – and makes for a great base for any toppings! This maple bacon brussels and pear salad is also lovely annnnnd perhaps my favorite ever – autumn arugula. If it’s not too weird flavor-wise: brussels caesar salads. These… are to die for. If you want to fill your bread basket with homemade goods, which I must admit, is a HUGE accomplishment and not something that I always do because I prefer to make them fresh and with ten other dishes, that’s difficult. But! 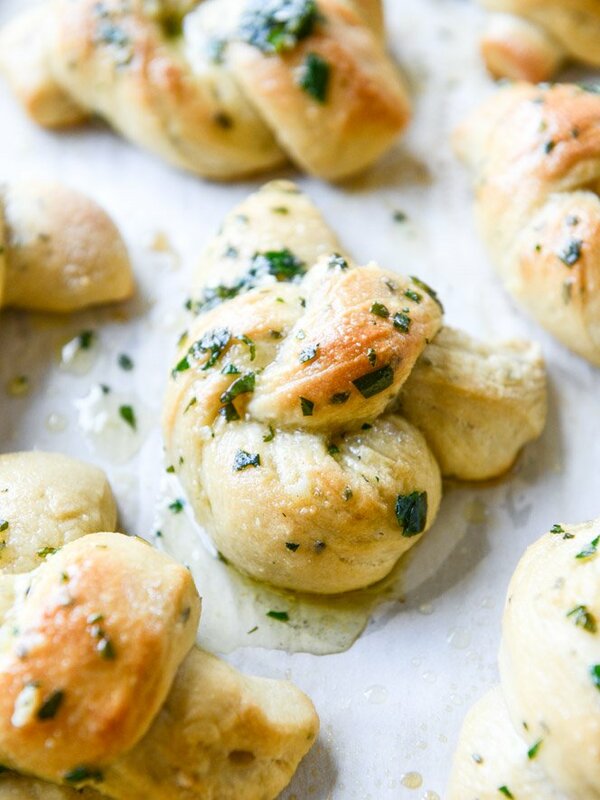 If you want something homemade, or better yet, want to assign someone to make these at home, I’d say go with the brown butter garlic knots. If those are too spaghetti-and-meatballs dinner for you, then homemade cloverleaf rolls and sweet potato dinner rolls are your best bet. The most classic, if you will. If you want something flakey, you can go with sage butter biscuits or fresh cranberry biscuits. Side note, it’s like four years later and I still think that the insides of cranberries are weird as heck. If you’re feeling SUPER ambitious, you can make mini cream cheese and chive biscuits. Or make ’em into big ones! We always have a traditional buffet-style Thanksgiving meal, but if I was having a slightly smaller, fancier sit down dinner, I would definitely start with soup! Maybe this roasted garlic potato soup with crispy brussels… or this smoky butternut soup. This is great. I’m starving! Since my mom always does a traditional roasted turkey, I only have one recipe here on the blog but it’s fantastic: it’s applewood smoked and comes with cider bourbon gravy. Eeeeeeeeeek. I KNOW. Now, for the BEST part of Thanksgiving – what it really revolves around: THE SIDES. My personal fave is stuffing and I’ve done it with soft pretzels and quinoa AND cornbread and sourdough. Don’t make me choose! Next up would be all the potatoes, and the dish I have taken to my parents’ house the last five or so years has been this lightened up sweet potato casserole. It’s definitely a winner, but I adore cinnamon sugar hasselback sweet potatoes and these buttermilk bacon blue smashed potatoes. Um, garlic goat cheese mashed potatoes anyone? I make these like every other month for Eddie. If you want to keep it simple, do it with brown butter. Annnnd in case you missed it earlier this week: loaded sweet potato BITES. Like delicious marshmallow casserole on a bite sized round. Yesssss. I’m a self-proclaimed brussels sprouts freak, which still makes zero sense to my mom. Seriously, she looks at me some days and is like, “Jessica, I can’t believe you eat brussels sprouts.” I CAN’T EITHER MOM! I love them fried and crispy, but since that takes a lot of time, you could roast them and serve with that aioli. They also work with brown butter because what doesn’t? You can even put them in LASAGNA. Other green things include lightened up green bean casserole, loaded skillet toasted green beans, bacon wrapped green bean bundles and bacon caramelized sesame asparagus. Orange things include pomegranate roasted carrots with – you guess it- brown butter. Sorry? A few untraditional but turning traditional favorites of mine include butternut lasagna (this one is delish, but I prefer the version in my book! ), roasted sweet potato risotto and spicy squash with feta and herbs. What are you thinking for dessert?! I always need at least a BITE of pumpkin pie, it just works. But I prefer chocolate on Thanksgiving, so these chocolate pecan pie bars are perfect. If you want to leave out the chocolate, try these pecan pie no bake cheesecakes! For pumpkin lovers, we have pumpkin s’mores cupcakes, a pumpkin s’mores tart or fudge striped peanut butter pumpkin cookies. If you’re feeling extra apple-y: amaretto apple crisp, bourbon baked apples and cider bourbon apple pie with oatmeal cookie crumble! Maybe I’ll get it together and make the pie. Maybe. If you want something slightly lighter than can even serve as a snack later on weekend, this caramelized pear upside down bread is so wonderful. Oh and just and idea: for Thanksgiving breakfast? Bacon cinnamon rolls, crockpot apple cinnamon steel cut oats or pumpkin waffles with bacon butternut syrup. Wowza. I feel like I just ate a five course meal. Oh, I pretty much live for your photo’s! I WILL be making those cranberry margaritas of yours this year. Yum! Salad is a waste of space at Thanksgiving, all those greens are taking up major real estate in my stomach, real estate that carbs could be inhabiting instead. I always put out a cheese and meat board, but sometimes I think it’s too much. We always have turkey with my great grandmother’s stuffing recipe, corn pudding, green bean casserole, rice pilaf (which my husband hates, he thinks we’re nuts for not having mashed potatoes), and orange rolls. I usually make 3 or 4 pies along with these awesome orange sugar cookies that my grandmother used to make. Grandmas have the best cookie recipes, they never fail. 3 or 4 pies! you’re amazing. um I love ALL of this. I’m attending someone else’s thanksgiving this year but I’m probably gonna bring thanksgiving (cranberry apple) jello shots that I’m posting tomorrow and whole30 cranberry sauce that i’ll post next week (its so good). and also Pumpkin Spice Latte Pudding Shots ( http://thepikeplacekitchen.com/2015/11/05/pumpkin-spice-latte-shots/ ) because YOLO. xoxo – P.S. thanks for teaching me how to make gravy today… I’ve always wondered if I could do it with chicken drippings and have it be good and your moms method seems fool proof! i can’t wait to see these jello shots! eeeep! Oh I can’t wait for next week after reading all of that! :) We’ll be going to my aunt’s house, so I am just making a few sides: Roasted Brussels Sprouts w/ cranberries & balsamic glaze (YUM! ), baked corn cassarole, and your Loaded Sweet Potato Soup from your CRATE soup class last year. I have made your goat cheese truffles for Easter and am now considering making a batch for next week. So good! ahhhh love that soup so much!! i gotta get it on my menu! My mom requested I make my bbq mac n cheese this year (https://diamondsandbacon.wordpress.com/2015/07/08/day-72-the-best-bbq-mac-cheese/) and my coworkers did too.. so I’ll be whipping up 3 batches! I’ll probably be bringing the green bean casserole and cranberry relish, can’t wait! Holy crap, now I’m hungry! My MIL does Thanksgiving RIGHT. She is amazing. She makes THE BEST mac n cheese, no seriously, IN THE WORLD. She makes like six HUGE pans of it and we’re all always fighting over it. She uses four cheeses: asiago, fontina, mild and extra sharp cheddar, ALWAYS. She also always makes a ham and a turkey, AND she puts turkey legs in a crockpot with barbecue seasoning. Like I said, amazing. i am very jealous and want to try this mac and cheese now. and she sounds like the kind of hostess i long to be! that’s incredible. Well, let’s just say I have quite a few of your recipes in mind! Tonight for Friendsgiving I am bringing the salted chocolate pecan bars you just posted, your Healthy Harvest Soup, Food Network’s Cranberry Salsa (oh my gosh try it http://www.foodnetwork.com/recipes/melissa-darabian/cranberry-salsa-recipe.html) and some charred Brussels! For Thanksgiving with family next week I am going to make your sweet potato casserole, possibly the green been casserole, and some brown sugar toffee cookies (Two Peas recipe). ah! i hope your friendsgiving tonight was awesome! Let’s just say I’m eating the pecan bars for breakfast this morning because I CANNOT PUT THEM DOWN! Cheese plate! Your cranberry margaritas, spinach salad, spatchcocked smoked turkey, grape and chèvre stuffing, mashed potatoes and mushroom thyme gravy, fennel gratin, something else green (brussels sprouts? ), jelled cranberry sauce, Zingerman’s rolls, and pumpkin pie. Writing this all out makes me think I should go start prepping something. My family is extremely traditional when it comes to Thanksgiving dinner- turkey, stuffing inside the bird, mashed potatoes, green bean casserole, squash mash, green jello mold (my aunt insists on making it every year and I have no idea who eats it), cranberry sauce, and rolls. Did I get everything? My mom is doing a pumpkin cheesecake this year, and I’m in charge of an apple dessert. According to my Instagram, I made homemade pie a couple years ago but I don’t know if I’m feeling it this year. I’m thinking a caramel apple crisp would be an easy, decadent, and delicious choice. I’ll probably whip up a pitcher or three of red wine sangria too, although your sangria recipes sound tasty too! my family is the same way actually. the first year i took butternut lasagna, they looked at me like i had 10 heads. I love your unconventional recipes! I have tried a few of them already and love your stuff girlie! This is a great line up! Thanks for sharing. I already hosted a Friendsgiving and made a brined turkey (recipe from Martha Stewart), cornbread casserole & gravy. People brought ridiculously delicious side dishes– a spicy pumpkin THAI soup being one, and a unique brussel sprout/squash cold salad. For “real” Thanksgiving I’m going to family– and likely bringing your cheeseball’s and the cornbread casserole again! i want that pumpkin thai soup recipe! Well I don’t live in North America so we don’t *have* to celebrate Thanksgiving in my house but we love food so we celebrate it anyway since it’s really close location wise AND we have people from all over the place here so the supermarkets do sales on all the traditional stuff anyway. That being said we don’t stick to tradition, the menu so far is looking – baked ham, whole roasted chicken, Honduran Enchiladas (made by my mother so good and these will be the first thing eaten, everyone loves them perfect appetizer), box stuffing, home made mash potatoes,home made apple pie, box caramel brownies oh and rice and beans and green bean casserole. P.S Your food looks so good and you are making it really hard not to just give in and cook everything for Thanksgiving. PS you are the goddess of the cheese board. I actually made the garlic goats cheese mashed potatoes last nights because I couldn’t wait until Christmas and as soon as my husband comes home he’s all ‘are those the Christmas potatoes?’ and the proceeded to eat half of them right there from the pan stood by the stove. We looooooove them! Small Thanksgiving with seating for three this year, and there are some dietary preferences to take into account–two vegetarians and one paleo eater. The paleo eater will bein charge of her own meat and also wants to make a salad for us to share. I’m making an Asiago cheese and roasted fennel quiche with wild rice crust, roasted vegetable medley, mashed butternut squash with red cabbage and apple compote, and a paleo cranberry-apple upside-down cake. impressive!! that sounds so, so good, especially the quiche! 6 or 7 for Thanksgiving dinner?! Ours is at 2 or 3 and I’m not sure I could wait much longer than that (Thanksgiving is my Christmas, it’s my all time FAV holiday). Plus, it still gives time for dessert AND then you know the leftover turkey sandwiches (with sides included) come out later that night! Yum Yum! I’m making these Roasted Cranberry Brussel Sprouts: http://sweetteasweetie.com/roasted-cranberry-brussel-sprouts/ because I want to spend as much time with family as possible and these are super fast to make! We go to my parents for thanksgiving and I am bringing your amazing lightened up green bean casserole. That has been my go-to Thanksgiving dish since you first posted it a few years ago, Everyone loves it!!! i love that! so glad! oh my gosh erin this sounds incredible!! -Green Beans with Caramelized Shallots and I want to bring dried figs and sherry vinegar in somehow? Still playing with that one. Did I mention this is all just for me and my husband? Our current bet is that we’ll be eating leftovers for 4 days, likely with some more turkey remaining. Never too much leftover turkey! i LOVE that you guys are doing this for just the two of you. I dont know!! Thanks for pointing it out. Haha. I volunteered to host the in-laws so I want to show off with out being too showy. UGH so many decisions. Hrmm is 3 sangrias too many? Thanks for the pile of ideas! Ugh… can I please just have it ALL!! Every last thing looks amazing. Even the veggie dishes, and I am like you… not so much into veggies. A necessary evil of life, but I totally want to dive into the carrots! And the pumpkin waffles with bacon butternut squash syrup?? Breakfast for dinner. Like, NOW. This year we are doing a friends & family Thanksgiving with neighbors. There will be 20-25(!) of us-my husband & I, my sister & BIL, neighbors, other neighbors plus that neighbors family visiting from out of state, and a few friends who are alone in town for the holiday. There has been a big coordination of who is bringing what & we’ve brainstormed about how to share fridges until the big day! We are smoking two turkeys and frying two other turkeys. Sides are oyster stuffing, mac & cheese (what can I say, I live in the South! ), kale & rice casserole w/smoked cheese (OMG TO DIE FOR and way tastier than it sounds), green bean casserole, homemade cranberry sauce, mashed potatoes (I’m making your goat cheese mashed potatoes! ), roasted brussels w/bacon & brown butter, maple whipped sweet potatoes, and I’m sure the gluten eaters (SOB NOT ME) will have some kind of rolls/bread. Apps/snacks are your gorgeous amazing pomegranate studded cheese ball, some veggies & dip, and spinach & artichoke dip. Desserts might kill us: pumpkin cheesecake, pumpkin pie, apple pie, and a flourless chocolate torte. There will be an insane amount of wine consumed. AHHHH! I CAN’T WAIT!!! I love Thanksgiving! this sounds like so much fun. 20-25!!! i feel like i’d need 5 fridges. I also really freaking love my Easy Thanksgiving Stuffing with Quinoa and Vegetables (http://www.fooduzzi.com/2015/11/easy-thanksgiving-stuffing-with-quinoa-and-vegetables/) and my Dairy-Free Pumpkin Spice Coffee Creamer (http://www.fooduzzi.com/2015/09/dairy-free-pumpkin-spice-coffee-creamer/)! My plans are slightly altered this year, as I’m spending Thanksgiving with my boyfriend’s family for the first time. I can’t FATHOM not cooking something to help with their Thanksgiving feast! We can’t leave until Wednesday afternoon and we have about an 8 hour drive ahead of us, so I’m stumped about what I can possibly bring! I want to contribute but I also don’t want to spend my first few hours in his family’s house attempting to take over his mom’s kitchen when we’ve only just met! Any suggestions of something that could make the drive and then be popped into the fridge and reheated, or should i just stick to a nice bottle of wine? i’d go the dessert route!! i think you should do the chocolate pecan pie bars because if they aren’t cut, they will stay SO fresh. and even if people don’t like nuts, they will probably like them! I’ll be honest with you, i don’t have that much skill in cooking, so i just make something simple and order the rest from nearby restaurant. Lol. Btw, I love your photos, those food look really delicious. We always make way to much food! Even when we only have a small group of people. We start the day with mimosas and bloody Mary’s. We normally only do two appetizers, typically a baked brie with fruit and bacon crackers (you must make these). Then we move over to your apple cider margaritas (they have become tradition in our family) served in mason jar glasses! this year I am making 3, yes 3 of your bourbon smoked turkeys! two of them are for my work thanksgiving and the other one is for our family thanksgiving. I’m pretty much obsessed with this recipe and our smoker! We will have a total of 3 turkeys at our thanksgiving. We make Sandra Lee’s butter herb roasted turkey (its fabulous), a fried Cajun turkey and of course your smoked turkey! for side dishes we have traditional mashed potatoes, sweet potato casserole, broccoli cheese casserole, dressing, my grandmothers mac and cheese (which is the most fattening thing I’ve ever consumed but its amazing), creamed corn, green beans, butter beans, my grandmothers biscuits, bacon Brussels sprouts, homemade cranberry sauce, and gravy. For dessert we always do my mothers pumpkin bars, pumpkin pie, apple pie, pecan pie, and sometimes a chocolate pie. Its way to much food but we love it! I’m also dying to make your butternut squash and sweet potato lasagna but worried my mother would flip! So I might make it for my work thanksgiving! Wow, all of your ideas (and everyone else’s) sound so amazing!!! Lot’s to be thankful for. Thanksgiving with my family is on Saturday – all apps, I’m assuming we will have shrimp cocktail, some kind of delicious meatballs, dips, pumpkin pies, etc. My cousin has a friend that makes some amazing dipped caramel apples – they’re all “trashed up” you would love them. Still havent decided on my apps yet…im indecisive. Tossing around the ideas of Brie phyllo bits with cranberry chutney, devils on horseback, your pom cheese ball, or maybe some kind of french onion bruschetta/dip. I thought about a pumpkin chili, mini portions but I’d prefer to try that first and I’m kinda out of time. His family keeps it very traditional. Although we did have a Turducken a few years ago and it was awesome! Turkey, stuffing, sweet potato casserole, broccoli casserole, pumpkin pies, pumpkin roll, cookies, desserts from Oakmont bakery that my sister in law makes a special trip for :) My mother in law also makes this delish bean side, its green beans and corn in a vinegar sugar mixture. It’s passed down from the Great Great grandmother. It’s unique and addicting! I think I’m going to make mashed potatoes. Usually I like to spice things up a bit w cheese or so, but I’m thinking of sticking with the classics, maybe I’ll take some and add some goat cheese, or add fixings we can DIY ourselves. oh an I disagree w salad on thanksgiving….there’s already enough damage done regarding calories….save it for the next day, maybe have a turkey salad w light apple cider dressing or something. Wow! I want to eat what everyone has posted. Coconut pumpkin pie!! I want to try it! This year I’m making a gigantic cheese plate, artichoke and cheese dip. Turkey as per Alton Brown’s Brined and Roasted recipe. Ground meat, chorizo and hot sweet peppers stuffing. Gravy as per your Mom’s recipe. Your garlic goat cheese mashed potatoes. Roasted sweet potatoes, carrots with fennel and apple cider maple dressing. Nutella lava cupcakes, pear tart, flourless chessecake with roasted strawberries. Aurugula salad with pecorinno romano. Pitcher of sangria. Still debating, if making the salad is worth it. The above is only MY PART. My SIL is in charge of the rest. Honestly I don’t even want to cook. But because my dad wants a turkey my mom is making the turkey. This is the first year I am vegetarian so I have no interest in even handling a raw bird. I like cornbread stuffing with veggie broth but my dad like boxed stuffing doesn’t so I might make both. Mashed potatoes are certainty but I need to try making the vegan by using Earth balance spread and vegan cream cheese and cashew milk. I will let you know how it goes. I will make a turkey gravy and a mushroom gravy. Sautéed green beans are my favorite with almonds to my parents like corn sautéed green beans are my favorite with almonds two and my parents like corn. Rolls might just be bake and serve. I always make a sweet potato casserole with a coconut pecan crumble. Also I’m going to make a vegan pumpkin pie with coconut milk and a cinnamon graham cracker crust. Oh did I mention I have a broken left wrist so I will be doing this over with one hand. We’re hosting this year. I’m going to use your mom’s method for gravy! I’m also roasting a turkey with tons of herbs and butter, making my green bean casserole (from my site), sour cherry and sausage stuffing, mashed potatoes, another green side, possibly a sweet potato and leek gratin I’ve been thinking about, a molded cranberry sauce with wine, and dinner rolls. PLUS, pecan pie and some other dessert or two. For snacking we’re doing a cheese plate. Because CHEESE PLATE. Also, my mom called today and wants crab legs. IDK how we’re going to eat all this food. So many fab ideas! My favorite is pom jeweled cheese ball! ? These photos are AMAZING and so are the recipes! This year my aunt, uncle, grandpa, and cousins are coming so a larger menu has been planned! My family is the SUPER UNTRADITIONAL POLISH family, but food is food. We’re starting off with guac -n- salsa as a snack before the meal. Pumpkin cupcakes with a luscious brown butter frosting will also be given out to those with a sweet tooth (ME). Then a nice bowl of traditional polish bean soup (aka GROCHOWKA- and it is NOT like a chili!) with crispy baked bread slathered with pounds of butter. Main courses will include turkey, possibly one recommended by you in your blog (first time!!!! ), and a beef and ale cobbler that my family IS IN LOVE WITH. Trying to be more traditional, the sides include your lightened up green bean casserole, a stuffing (can’t decide between a spicy herbed stuffing or your double bread with bacon stuffing), creamy mashed potatoes, mashed by the king of starch and butter himself, and cauliflower and rice! And to finish it off, PIE. I usually bake everything in the family, but keeping with our tradition, 2 pies from baker square will be order (BAKER SQUARE = LIFE). One being a favorite, caramel pecan silk supreme, and the next being a good ol’ pumpkin pie (the only people that eat it is my dad and I, but that’s ok. The more the merrier). Woah, didn’t expect all that (gestures to the whole paragraph) to happen, but I hope you have a fantastic Thanksgiving and I can’t wait to read more from your blog! My husband and I stay home for Thanksgiving. While we miss our families, it’s our time to do what we want. We do the good old standbys – turkey, cranberries and lots of buttery mashed potatoes. Oh, and pecan pie – of course. But, for the last three years, the star of the show is our dressing made with your sage butter biscuits. It is amazing. A little (okay, a lot of…) sausage, some celery, onion and nice homemade turkey stock. It’s absolutely amazing. Thanks for the wonderful biscuit recipe. It has turned our Thanksgiving dinner from ordinary to extraordinary. Happy Thanksgiving!! I am obsessed with all of these. Your photos make me want to get my stretchy pants out and start cooking!